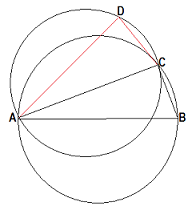 In the circle of diameter $AB$ it is well known each point $C$ determines a right triangle $\Delta ABC$ and so it is with every point $D$ on the circle of diameter $AC$ determining a right triangle $\Delta ACD$. 1) Are there points $C$ and $D$ such that $(AB, BC, CA)$ and $(AC, CD, DA)$ be pythagorean triples and the triangles $\Delta ABC$ and $\Delta ACD$ being of equal area?. 2) Assuming $BC = CD$, prove that the possibility that both $(AB, BC, CA)$ and $(AC, CD, DA)$ are pythagorean triples depends on the parity of $BC$, possible in one case and impossible in the other. Browse other questions tagged diophantine-equations euclidean-geometry or ask your own question.